Münster/Berlin, 19 March 2019 – In the case Bin Ali Jaber v Germany, the Higher Administrative Court in Münster found in favor of the claimants from Yemen on key aspects. Germany must now take action to ensure that the US respects international law in its use of Ramstein Air Base. Ramstein plays a key role in US drone strikes and thus in many cases in the deaths of innocent people. “My hope is that Germany stops the use of its territory for the drone program. We do not wish any other family to suffer from the same senseless attacks,” says Faisal bin Ali Jaber, one of the claimants. In August 2012, he lost two members of his family in a drone strike in Yemen. The airbase at Ramstein hosts a satellite relay station as well as personnel that are crucial for drone operations in the region. This is why, in October 2014, Faisal bin Ali Jaber and two other members of his family brought a legal action against the German government. They are calling on Berlin to forbid the use of Ramstein for drone strikes. The German government’s response has been to deny any knowledge of or responsibility for the drone strikes. 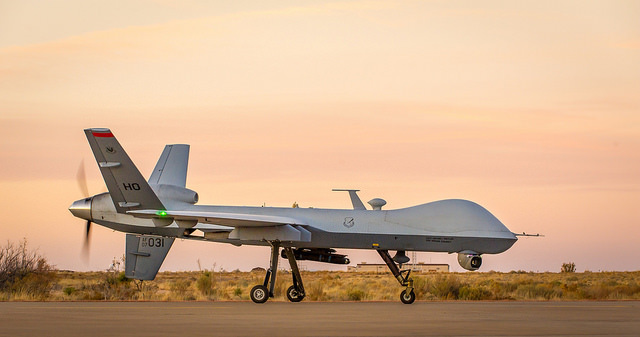 This lawsuit on Germany’s role in the US drone program is part of ECCHR’s legal interventions on human rights violations committed by the US in the name of countering terrorism. ECCHR and its partner organization Reprieve are assisting the claimants and their lawyers. The claimants are represented by the lawyer Sönke Hilbransfrom Berlin. Both organizations have been working on legal challenges to US drone strikes for over ten years. More information (case report, legal background and videos) on the case Bin Ali Jaber v Germany can be found here.